The government will shortly set up a committee of experts to look into the existing small savings schemes and prepare a roadmap for fully migrating into a comprehensive EET (Exempt-Exempt-Tax) system. The Oil and Natural Gas Corporation leads 30 Indian companies which have found place in the Forbes magazine’s coveted list of top 2,000 corporate titans across the world. The industry in the northern region has a potential for a double-digit growth. However, to attain that measures like agri sector reforms, streamlining of state finances, development of physical infrastructure and focus on education, healthcare and overall social development are imperative, said Mr Rakesh Bharti Mittal, Chairman, CII northern region, on the occasion of inauguration of the CII's zonal office here today. The hotel and restaurant industry in the country has an annual induction capability of 15,000 trained personnel at all levels. Kenyan High Commissioner Mutuma Kathurima is visiting the city to develop economic ties with Punjab and Haryana and to "speak with potential investors." 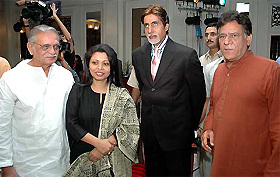 Lyricist Gulzar, Nandita Puri, mega-star Amitabh Bachchan and Om Puri at the launch of Nandita Puri’s new book Nine on Nine in Mumbai on Friday night. There might not be any increase in the prices of petrol, diesel and LPG “for the time being”, Petroleum Minister Mani Shankar Aiyar said today. No one, not even Minister of State for Civil Aviation Praful Patel, knows what is the exact status and health of international, national and other airports in the country. Half-baked schemes are announced, incomplete programmes are highlighted and lofty words spoken. Q: On Sunday, 20th March 2005, replying to the point raised by Mr J.S. Singhota that the sale of shares of Ultra Tech Cemco Ltd. would attract provisions of capital gains, we had expressed concern about the bifurcation of the cost between the existing L&T shares and the newly issued shares of UTCL for the purposes of calculation of capital gains. Pop a tea pill if you can't have a cup! An EET system of savings schemes provides for tax exemption at the first two stages (contribution and accumulation) of savings but is taxable at the withdrawal stage. For instance, if a subscriber is contributing money to a provident fund, under the EET system, his contribution and the interest accumulation thereto will not be taxed, but the withdrawal of money from the fund will be taxed. The government has already introduced the EET-based taxation in the defined contribution pension scheme, which is applicable to newly recruited government servants. Sources said the committee is most likely to be set up after the Finance Bill 2005 is passed by Parliament. The Finance Bill 2005 will come up for discussion in Parliament when it reassembles after a three-week recess on April 18. Sources indicated that considering that the Employees Provident Fund Organisation (EPFO) is catering to the largest number of tax savings subscribers under a single fund, the Commissioner of the EPFO might be made a member of the committee which will lay down the contours of the new EET system. The committee would go into the whole gamut of issues pertaining to tax and its correlation with tax-exempted savings instruments. Under the existing treatment, most of the small savings instruments come under the EEE (Exempt-Exempt-Exempt) category, where the contribution, interest accruals and withdrawal are exempted from tax. These include instruments such as deferred annuity plans, provident funds, superannuation funds, post office savings bank deposits, securities of the central government, national savings certificates, equity and debentures of infrastructure companies and certain pension funds of LIC. The committee would go into the details of the existing schemes and recommend a possible mix of financial instruments that would be eligible for the EET system. It would also look into a plethora of administrative issues and examine the need for “grandfathering” of the existing scheme as suggested by the Kelkar Task Force. “Grandfathering” means an alteration of the rules that apply to certain investment or investment techniques while stipulating that investment actions taken before a certain date remain subject to the old rules. For example, the law may be changed by stipulating that certain types of bonds no longer pay tax-free interest, while at the same time the bonds issued before the date on which the new law is to take effect continues to be governed by the existing rules. The Indian companies in oil and gas and banking sectors dominate the list which includes corporations from manufacturing and software to utilities and telecommunications. ONGC occupies the 265th position closely followed by the State Bank of India group listed at the 269th and Indian Oil at 273rd positions. The rankings are based on four metrics: sales, profits, assets and market value. Citigroup tops the world list followed by General Electric, American Intl Group, Bank of America and the HSBC Group. The other Indian companies in the list include Reliance (309), National Thermal Power (486), ICCI Bank (757), Steel Authority of India (831), Bharat Petroleum (914) and Hindustan Petroleum (1011). Following them are Tata Consultancy (1167), Punjab National Bank (1186), Gail (India) (1250), Infosys Technologies (1250), Canara Bank (1260), Tata Iron and Steel (1302), ITC (1336) and Wipro (1362). Further down the scale are HDFC (1364), Bank of Baroda (1370), Bank of India (1371), Tata Motors (1519), Union Bank of India (1618), Bharat Televentures (1648), Oriental Bank of Commerce (1811) and Mahanagar Telephone Nigam (1835). At the bottom of the listing for Indian corporations are Bharat Eelectricals (1907), Ranbaxy Laboratories (1936), Indian Overseas Bank (1959), Hindelco Industries (1982) and Larsen and Toubro just made the list at the 1996th position. While Citigroup remains at the top for the second year, there was a lot of movement in the top 10 this year. ING Group debuted at nine this year, and strong entries from the banking and commodities sectors fill the top10, such as the Bank of America at four and BP at number eight. Twenty-four of the top 50 companies are based outside of the USA, spanning 52 countries and 27 different industries. The office in Ludhiana is the CII's 47th office which would not only provide a platform to voice industry's concerns, but it would also work in close cooperation with the state government and district administration. Mr Mittal said the CII would endeavour to provide value-added services to industry and give special emphasis on the growth of small and medium enterprises (SMEs) so as to enhance their competitiveness. Emphasising on the need to tap opportunities, Mr Mittal said India needed to work towards improving its human resources and also its business competitiveness. He said the measures like developing clusters could go a long way in helping industry face global competition. The cluster development programmes initiated by the CII in Mohali and Gurgaon had immensely helped industry and similar results can be attained in Ludhiana as well. "In Ludhiana, several clusters like sewing machine, light engineering goods, hosiery and bicycles can be developed," he said. Mr Mittal also welcomed introduction of value-added tax (Vat) and said it would go a long way in making industry competitive. "Even the states that have not implemented it would be forced to introduce Vat considering it's benefits," he said, adding, "it is a first step towards moving forward." He said the industry would support the Centre as well as state government on this issue. Mr Mittal also emphasised on the industry's participation in social development. In areas like technical and primary education and healthcare, industry can contribute a lot, he said. As per secretary-general of the Federation of Hotel and Restaurant Association of India (FHRAI) Shyam Suri, if the turnover demand from new units and current high growth in tourism and hotel occupancies in the country is taken into account, there would be a much higher requirement of graduates from hotel management institutes in the industry during the next few years. The industry, he says, has the potential for absorption, if trained manpower is available. Besides this, taking into account the new hotel classification guidelines of the Department of Tourism, according to which five star and five-star deluxe hotels have to employ 30 per cent, four star 25 per cent, three star 20 per cent, two star 15 per cent and one star 10 per cent trained manpower, hotel management students will find it easier to gain foothold in the industry. The FHRAI, an apex industry association like Ficci, the CII and Assocham, has affiliations of regional and state-level associations, and about 2,700 direct members, including all 5-star deluxe, 5 star and other category hotels. It is also opening the FHRAI Institute of Hospitality Management, near Delhi, says Suri, adding that for the first time an industry-specific association has decided to open an educational institute in the country. Indian hotel management graduates and managers are also in high demand in the Middle-East and even in developed countries. This is the best time for management graduates and professional managers in the hospitality industry, he adds. Every year, as many as 8,000 students graduate with a three or a four- year degree and diploma courses, and another 4,000 with a one or two- year certificate courses. A large number of non-hospitality trained graduates are also employed by hotels and restaurants, which give on-the-job training. In India, there are 34 National Council of Hotel Management and Catering Technology institutions under the Department of Tourism, of which 24 are Institutes of Hotel Management (IHMs) and 10 Food Craft Institutes (FCI). There are 3,000 seats in the 3-year degree courses in IHMs, and 1,500 seats in FCIs for a one-year certificate courses. In a meeting with industrialist Kewal Dhillon and Chief Parliamentary Secretary, Punjab, Rana Gurmeet Sodhi, recently, the High Commissioner was assured of the fullest cooperation from Punjab. The details on the areas of focus will be finalised soon. The High Commissioner also met several potential investors in the pharmaceutical sector, distilleries and fabrics. Currently, the balance of trade is in favour of India by the ratio of 6:1 and the two governments are exploring how the imbalance can be bridged. Mr Kathurima’s elaborates on the key areas of focus which are an integral part of Kenya's commitment to economic reforms, poverty alleviation and welfare measures for its people. These amusing goings-on cause dismay and despair in vital aviation sector which, owing to partial opening of skies, continues to languish in midair. Take the case of Amritsar airport. A few days back, the construction work on the much-delayed terminal building was halted for man-made technical snags. Now the minister has stated that 30 non-metro airports, including Amritsar and Chandigarh, will be upgraded at an estimated cost of Rs 5000 crore in the next three years. No one is willing to say when the Amritsar airport, for example, will be fully functional. The modernisation plan of Delhi and Mumbai airports continues to stay on the drawing board. Bids, according to the minister, will be invited ‘soon’ and the work would start ‘shortly’. Judging from the functioning of the ministry, these airports would become obsolete by the time estimated expenditure of Rs 15000 crore is spent on modernisation. While several airports in the East, like Hong Kong, Singapore, Kuala Lumpur, China, Japan and even Bangkok (Thailand) are among leading airports, Delhi and Mumbai airports are languishing at bottom. Why? Not that there is any dearth of talented engineers and other experts. It is because of red-tapism and little understanding between politicians and bureaucrats. Nothing concrete or worthwhile has been achieved in the past 10 years in the sphere of airport modernisation. All one reads is negative news in which the Central Industrial Security Force (CISF) has been nabbing government and non-government officials for corruption. What is this talk about ‘poaching’ of pilots from national carriers to private airlines? In the open sky scenario, what is wrong if a pilot moves from Air-India or Indian Airlines to Jet or Sahara? Pilots and industry will have self-discipline only when politicians exercise and practice discipline. The minister has pleaded for reduction of tax on aviation turbine fuel (ATF) in the country. This is a very valid suggestion and reduction in taxes will help reduce fares. But two national carriers will continue to stay in trouble as they are grossly over-staffed. Renaissance in national airlines will take place only when ‘dead wood’ is thrown away. Without much fanfare or loud talking, Indian Airlines has launched a daily service from Delhi to Kuala Lumpur via Bangkok and back. This is a very busy sector and IA’s operations will be a grand success. The additional seats — 2030 in a week — will considerably reduce congestion on this route. It is learnt that some other airlines and working overtime in launching operations on this fast growing sector. Apart from this widely accepted service, Indian Airlines has many other far-reaching schemes and programmes to face head-on competition from private competitors. The more, the merrier is the slogan of IA officialdom. IA will have from 151 to 178 flights a week to 18 destinations from this summer. Singapore, for example, has set up a regional office in Delhi to help promote aviation and tourism. According to Singapore Tourism Board (STB) and Chief Executive Lim Neo Chian, as many as 47100 Indians visited Singapore in 2004. “In tandem with the buoyant growth forecast of the Indian economy, we are confident that India will continue to be among Singapore’s fastest growing market”, said Lim Chian. Air-India’s Delhi to Los Angeles via Frankfurt flight should be popular and profitable, if handled meticulously. There is a mammoth potential on this sector. AI will fly from Delhi three times a week and four times from Mumbai. There is no change of aircraft on this sector and the flight takes about 20 hours. The Boeing 777 aircraft provides 296 seats. According to industry analysts, the success of AI is possible only when it has ‘friendly relationship’ with agents. With Air-India entering the US market in a big way, there is every possibility of fares of dipping to around Rs 31000-32000 plus taxes. Currently, the fare is about 36,000 plus taxes. Q: On Sunday, 20th March 2005, replying to the point raised by Mr J.S. Singhota that the sale of shares of Ultra Tech Cemco Ltd. (UTCL) would attract provisions of capital gains, we had expressed concern about the bifurcation of the cost between the existing L&T shares and the newly issued shares of UTCL for the purposes of calculation of capital gains. We were pleasantly surprised to receive prompt clarifications on the issue from Mr N.H. Vasa, Mr Amar Kakaria, and Mr Vikash Baingani, all officials of L&T. We are truly thankful and appreciative of their efforts to throw light on the issue and we are sure readers of our column would share the same sentiment. A: The following is the gist of the correspondence we received from the above named persons. They have emphasised that the tax treatment outlined hereunder is based on the opinion of leading counsel. However, there is always the possibility that the AO concerned may differ in his views. Therefore, the company does not take any express or implied liability arising from this tax treatment. “At the outset, we wish to draw your reference to our website — www.larsentoubro.com, in which, under the item Financials / Investor Info, we have loaded a .pdf file giving a detailed presentation of the computation of “Cost of Acquisition” of the shares of UTCL allotted pursuant to demerger of cement undertaking of L&T, in accordance with the provisions contained in the Income tax Act and based on the expert’s opinion. This is for the guidance of the shareholders of L&T & UTCL. As you must be aware, in terms of the provisions of Section 49(2C) of the Income-tax Act, the cost of acquisition of the shares in the resulting co. (i.e. UTCL) shall be the amount which bears to the cost of acquisition of shares held by the person in the demerged company (i.e. L&T, prior to demerger) in the same proportion as the net book value of the assets transferred in a demerger bears to the net worth of the demerged company immediately before such demerger. The proportion of net book value of assets transferred to UTCL (i.e. 1002.12 crore) to the net worth of L&T before demerger (i.e. 3177.58 crore) results into a figure of 31.5%. The cost of acquisition of share of UTCL will thus be 31.5% of the cost of share originally held in L&T. Since the aforementioned ratio has been determined in accordance with the provisions of Section 49(2C) and finds support from leading counsel, we do not expect any litigation respecting the same. However, it is possible that some Assessing Officer / Appellate Authority could take a different view. We, however, take no express or implied liability while providing the guidance to the shareholders. Q: Please could you advise the withholding tax % on gain, an NRI will suffer if he liquidates his holding in the mutual funds before completion of 1 year and after completion of 1 year of investment. A: If you hold units for over 1 year, you earn long-term gains. Else you earn short-term gains. For short-term gains, the withholding tax rate will range between 30.6% and 33.66% as per the applicability of surcharge. The surcharge is applicable only if the income in question is above Rs 8,50,000.